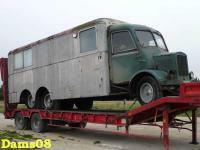 During the World War II the company took a part in a development of advanced armored transporters (8x8) according to an idea of the Cook brothers. Trucks consisted of two identical short wheel base tractors (4x4) - front and rear, between which was mounted a low loader flatbed for tanks. For loading and unloading it unhooked from the tractors and fell to the ground. In 1945 the prototype T8 with total weight of 43 t and 18 m length was built, included two trucks with 240-horsepower 18-liter engines Hall Scott and 29-inch wheels. It was designed to carry tanks M26 and could reach 50 km/h. The updated version T8E1 got two tank engines Ford rated at 500 hp. The transporter T9 (1950) was used for carriage of the caliber 280 mm howitzer.